You temper chocolate if you want it to stay shiny and not develop a white bloom with time or in the fridge. So you’d usually temper for decorating cakes or making special chocolates. Tempering chocolate is quite straightforward but you need to be precise with your temperatures and use good-quality chocolate that has been stored properly and not developped a white bloom. 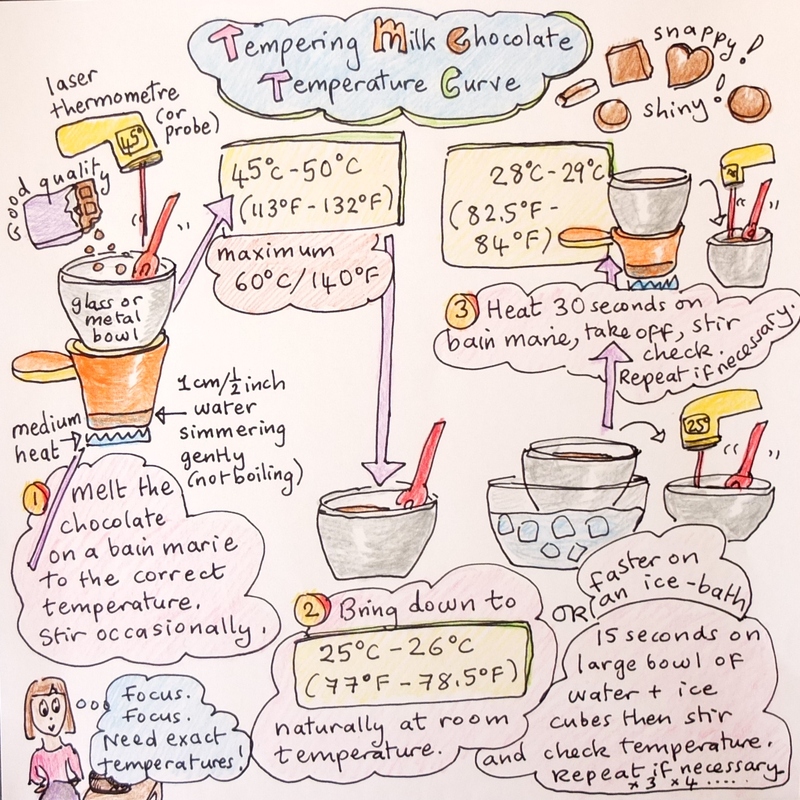 The ice bath method of tempering chocolate is particularly convenient if you live in a warm climate or do not have a marble surface to spread chocolate for the spreading method of tempering chocolate. before you start make sure none of your utensils or the work surface are wet. Water should never touch the chocolate. Dry your bowls and rubber spatula or plastic spoon well at the start. use a thermometre – it can be a standard sugar thermometre but probe is better to take the temperature of the chocolate when it’s spread out. The most convenient for chocolate work is the laser thermometre. Melt the chocolate (broken into small pieces) very gently on a bain marie to between 45°C and 50°C/113°F and 132°F. The bain marie should not boil but simmer very gently, so take off heat for a moment if necessary. Use a thermometre to make sure the chocolate doesn’t get too hot, taking off the bain marie for a moment if necessary. Even off the heat your chocolate will keep melting as you stir. Leaving at room temperature. The most natural way to bring the temperature down is to take it off the heat and leave at room temperature for a while. The Cordon Bleu chefs usually made us do Stage 1 of chocolate tempering at the beginning of class so the chocolate could naturally come down in temperature while we made other elements of the cake. Cooling faster on an ice bath. If you need to cool the chocolate faster then fill a second larger bowl with ice and water. Place your bowl of chocolate in the bowl of ice and water for 15 seconds (no water must touch the chocolate). Take it out and stir the chocolate vigorously. Check the temperature with your thermometre. If it needs to cool more but back briefly on the ice bath. When it’s almost at the right temperature let it cool naturally or place only 3-4 seconds on the ice bath. Do this on a bain marie. First leave 30 seconds on the bain marie. Take off and stir vigorously. Check the temperature then put back on the bain marie if necessary. When getting near to your temperature just leave 5 seconds on the bain marie before stirring and checking. Warning: if you go higher by more than 1 or 2° than the correct temperature you need to start the whole process again from Stage 1. For dark chocolate you need to start again if it reaches 33°C/91°F and for milk/white chocolate at 31°C/87°F. WORK WITH THE CHOCOLATE IMMEDIATELY! When you’ve reached the correct temperature you must work with the chocolate immediately! Your chocolate should be fluid and easy to work with. If it cools and starts becoming thicker and difficult to work then warm it very quickly on the bain marie again to the correct temperature. Again, be careful and don’t overheat. Keep calm. Stay patient and precise. Look on it as a kind of game to reach all the correct temperatures. If at first you don’t succeed try and try again.